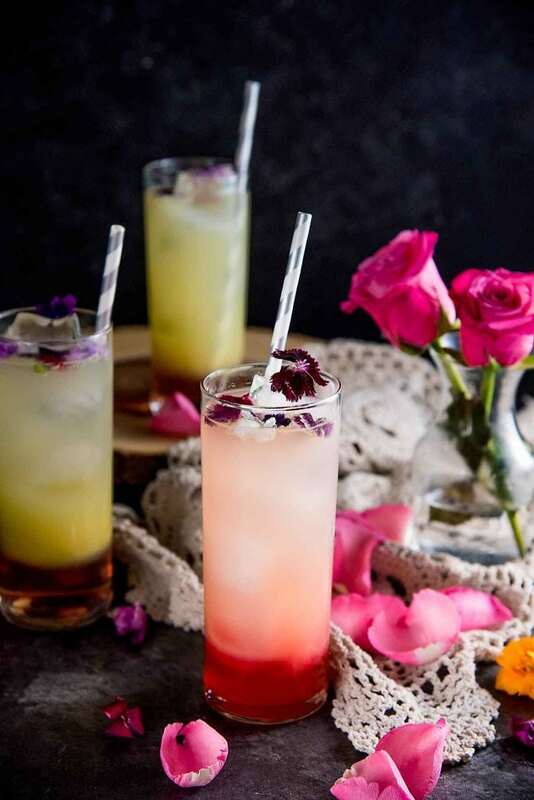 This gorgeous and refreshing Ginger Rose Fizz is made with rose syrup, lemon juice, ginger juice and club soda, and has a beautiful spicy and floral flavor profile. 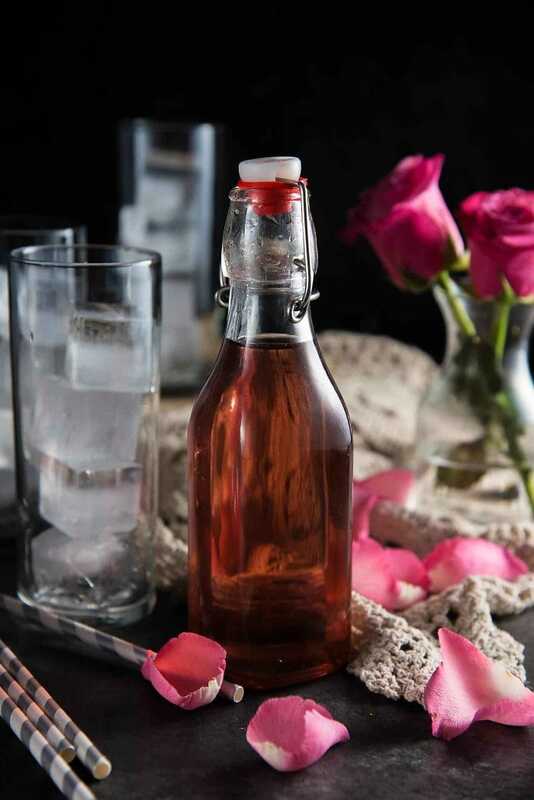 Perfect as a Valentine’s Day rose cocktail or mocktail, or for any celebratory moment in your life! This is a really fun, colorful and refreshing drink that’s perfect for serving guests at a party, or for any celebratory moment in your life. And it’s the perfect valentine’s day drink too of course. You can make it into a rose cocktail with the mere addition of vodka (or gin), or it can also be served as a non alcoholic gourmet sparkling drink. I’m really crushing on floral flavors these days and the result was this spectacular ginger rose fizz! 🙂 It’s made with a refreshing rose syrup (made with rose water), and I garnished it with edible flowers too. The base for this ginger rose fizz is a rose syrup, and I used the plain AND the vanilla rose syrup that I previously shared here. 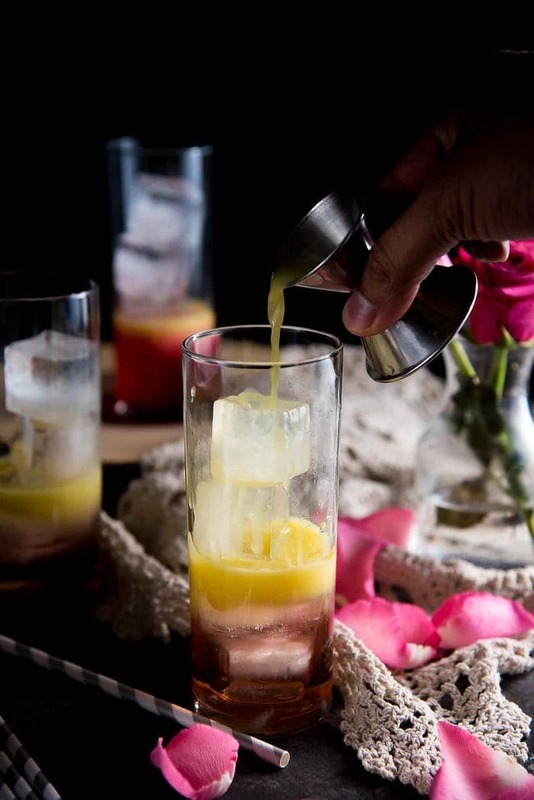 While this ginger rose fizz takes on the color of the lemon and ginger juice (a pale yellow to colorless), you can use a colored rose syrup which gives that pretty pink hue and color gradient. I also liked the flavor of the vanilla rose syrup more than the plain rose syrup as the vanilla obviously adds another layer of subtle flavor. If not pink/red, you’re more than welcome to make this ginger rose cocktail in any color you want by using coloring of your choice. Another option is to add a few drops of GRENADINE to get a more subtle pink color without using food coloring. 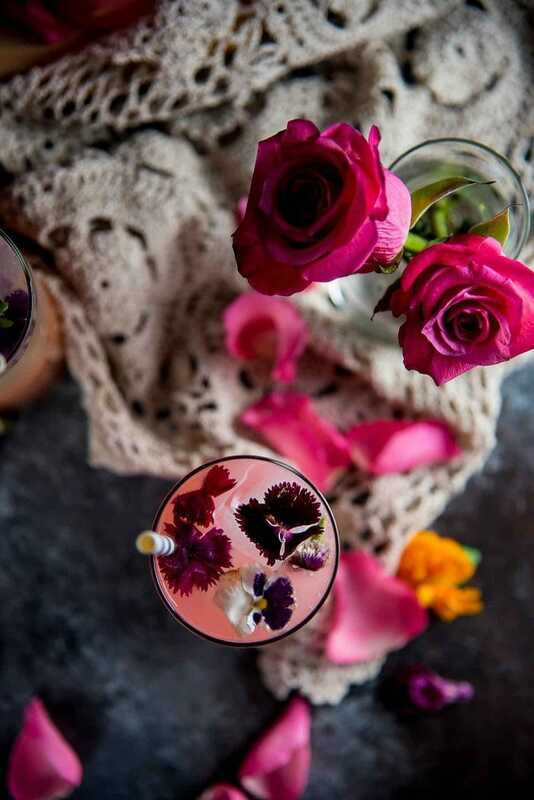 The way I made this floral rose drink (rose cocktail) is simple, and you can prepare it in two different ways too. Add ginger juice (you can either buy unsweetened ginger juice, or make you own with a juicer), lemon juice and rose syrup in a glass and then top it all up with ice and CLUB SODA. OR, add lemon juice and rose syrup in a glass, and top it with ice and GINGER BEER. 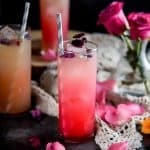 How can I prepare this ginger rose fizz drink ahead of time to make it easier to make the rose drink or rose cocktail for a crowd? If you’re using club soda – you can mix rose syrup : ginger juice : lemon Juice together in a 2 : 1 : 1 ratio, and store it in the fridge. If you’re using ginger beer – you can mix rose syrup and lemon juice at 2 : 1, and store it in the fridge. 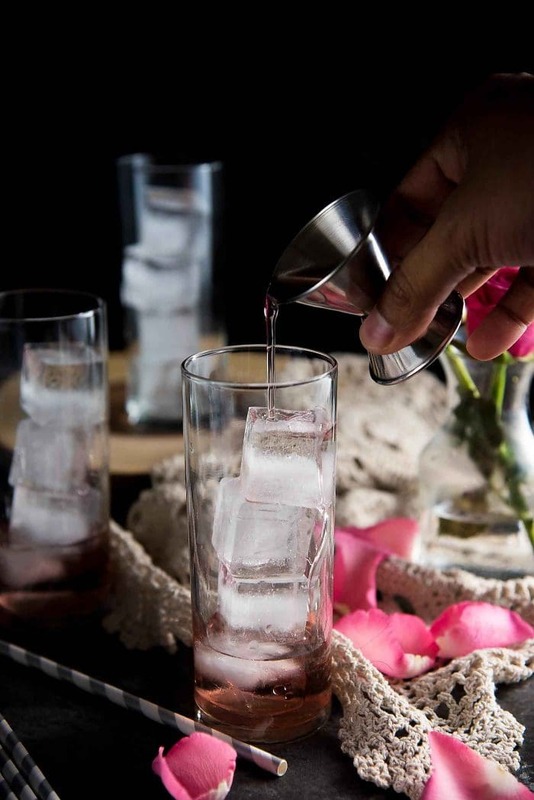 If you’re making a floral rose cocktail, then make sure you add vodka or a beautiful floral gin. You can serve this as a sparkling cocktail OR without the club soda, in an old fashioned glass or cocktail glass. 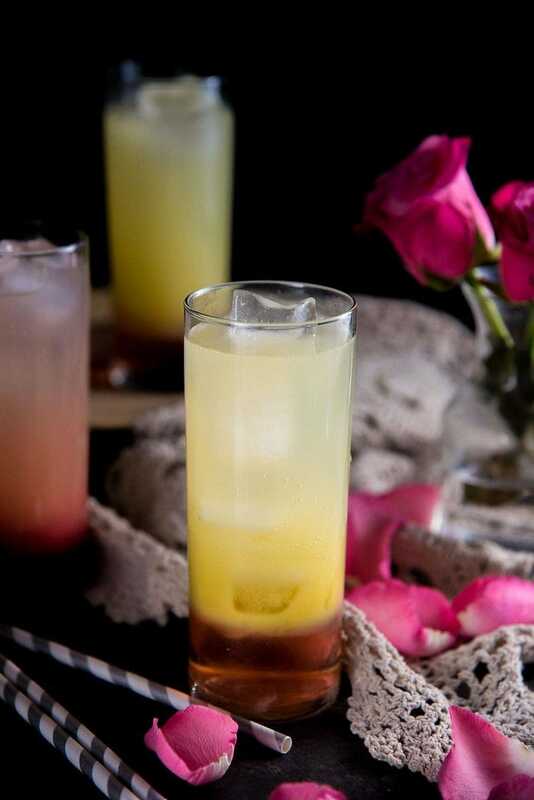 The base flavors of this ginger rose fizz (rose, ginger and lemon) work so well together, so you can serve this drink however you like and still get a nice artisan mocktail. Because of the beautiful pink hues and the refreshing, spicy and floral flavor combination, it makes for a delicious Valentine’s Day drink with a twist! 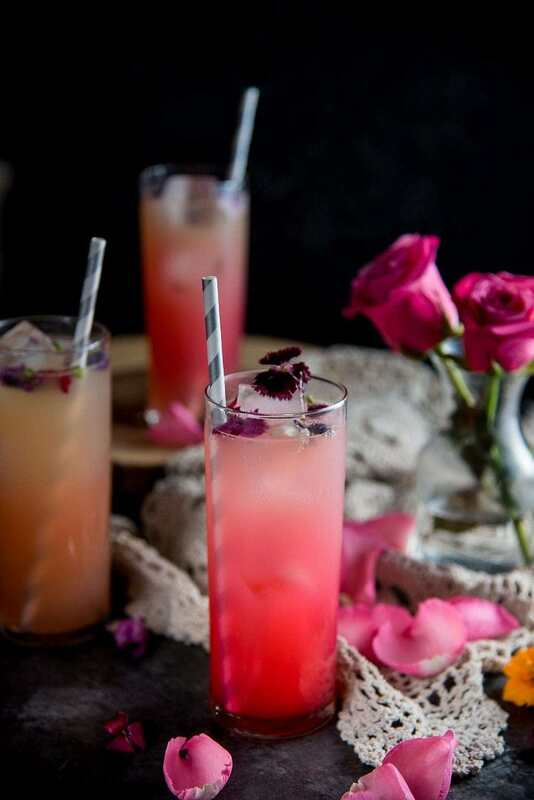 Floral Ginger Rose Fizz - a gorgeous, spicy and floral mocktail made with rose syrup, lemon juice, ginger and club soda! Perfect for spring and summer celebrations and especially Valentine's Day. This recipe requires rose syrup that you could buy in stores if available, or you can easily make your own. Recipe link is provided. Place the ice in a serving glass. Pour the rose syrup, lemon juice, and ginger juice over the ice. Top up with cold club soda. Serve with edible flowers (optional). NOTE 1 - if you cannot find it, omit the ginger juice from the recipe and top the drink with ginger beer or ginger ale instead of club soda. NOTE 2 - to make this into a cocktail, add 2 fl oz of vodka or gin before topping up with club soda or ginger beer. 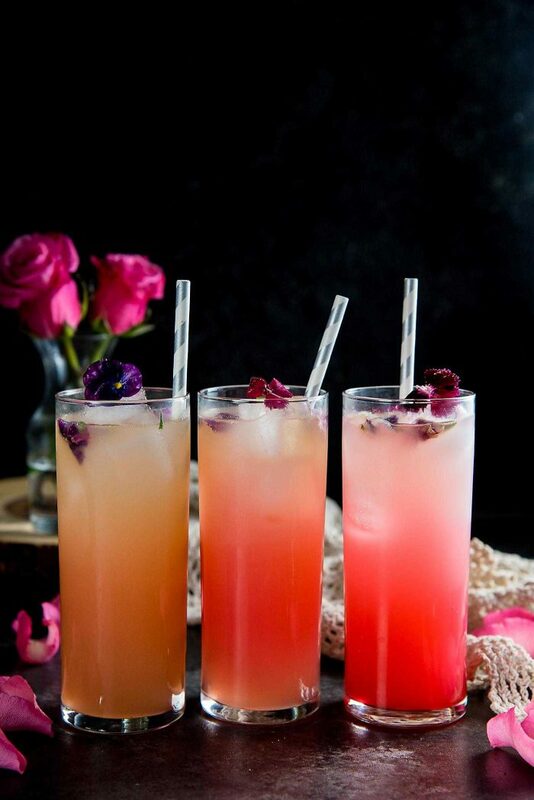 If you liked this blushing ginger rose fizz drink recipe, don’t forget to subscribe for new (and free) recipes by entering your email address in the subscription box below (and get all these recipes delivered straight to your inbox), so you don’t miss out on a thing. You can find me on FACEBOOK, TWITTER,INSTAGRAM, PINTEREST, YOU TUBE and GOOGLE-PLUS too. I am loving the pictures you took of this cocktail…absolutely gorgeous. I can’t wait to give the recipe a try. This drink is as refreshing as it is pretty!